The Brattleboro Arts Committee will meet on Wednesday, April 17, 2019, at 1:00pm in the Hanna Cosman Meeting Room at the Municipal Center. 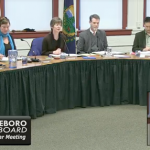 The Brattleboro Representative Town Meeting Finance Committee will meet on Wednesday, April 17, 2019, at 5:00pm in the meeting room at the Brattleboro Tennis Club (202 Cedar Street). The Brattleboro Traffic Safety Committee will meet on Thursday, April 18, 2019, at 8:00am in the Selectboard Meeting Room at the Municipal Center. 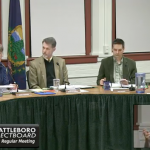 The Brattleboro Selectboard gathered for their last regular meeting under the current configuration of board members – Chair Kate O’Connor and Shanta Lee Gander are about to return to civilian life. The Country Club was reprimanded for a liquor infraction, causing the board to offer them time to do some free promotion. (Note to other liquor license holders – minor infractions will lead to publicity!) Bids were accepted, the Energy Committee was reduced in size, and representative town meeting motions were assigned. The Brattleboro Selectboard handed out annual liquor licenses then held an extended discussion about COSU, a collaborative community project to tear down silos and create connections between addiction and recovery programs in the community. It’s the last regular meeting of the Brattleboro Selectrboard before elections in March, and the agenda is a light one. The board will talk liquor and drugs, finances, an exemption to the plastic bag ordinance, and will review their goals and progress. They also pay attention when you bring up that other item not on the agenda, during public participation. The Brattleboro Arts Committee will meet on Wednesday, February 20, 2019, at 1:00pm in the Hanna Cosman Meeting Room at the Municipal Center. The Brattleboro Traffic Safety Committee will meet on Thursday, February 21, 2019, at 8:00am in the Selectboard Meeting Room at the Municipal Center. The Brattleboro Representative Town Meeting Finance Committee will meet on Thursday, February 21, 2019, at 5:30pm in the Cusick Conference Room (2ndfloor) of the Windham Regional Career Center, located at 80 Atwood Street. 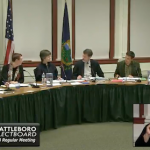 The Brattleboro Energy Committee will hold a special meeting on Thursday, February 14, 2019, at 5:00pm in the Hanna Cosman Meeting Room at the Municipal Center. The Brattleboro Representative Town Meeting Finance Committee will meet on Thursday, February 14, 2019, at 5:30pm in the Cusick Conference Room (2ndfloor) at the Windham Regional Career Center (80 Atwood Street). The Brattleboro Representative Town Meeting Finance Committee will meet on Thursday, February 7, 2019, at 5:30pm in the Cusick Conference Room (2ndfloor) of the Windham Regional Career Center, located at 80 Atwood Street. The Brattleboro Citizen Police Communications Committee (CPCC) will meet on Monday, January 28, 2019, at 5:30pm in the Brooks Memorial Library Conference Room. The Brattleboro Representative Town Meeting Finance Committee will meet on Thursday, January 31, 2019, at 5:30pm at the Windham Regional Career Center (located at 80 Atwood Street) in the Cusick Conference Room (2ndfloor). The Brattleboro Energy Committee will meet on Monday, January 14, 2019, at 5:00pm in the Hanna Cosman Meeting Room at the Municipal Center. The Brattleboro Representative Town Meeting Finance Committee will meet on Thursday, January 17, 2019, at 5:30pm at the Windham Regional Career Center (80 Atwood Street) in the Cusick Conference Room (2ndfloor). The Brattleboro Representative Town Meeting Finance Committee will meet on Thursday, January 3, 2019, at 5:30pm in the Cusic Conference Room (2ndfloor) at the Windham Regional Career Center, located at 80 Atwood Street. The Brattleboro Tree Advisory Committee will meet on Tuesday, December 11, 2018 at 6:30pm in the Mezzanine Conference Room at Brooks Memorial Library. The Brattleboro Representative Town Meeting Finance Committee will meet on Thursday, December 13, 2018 at 5:30pm in the Cusick conference room (2nd) floor at the Windham Regional Career Center located at 80 Atwood Street. The Brattleboro ADA Advisory Committee will meet on Friday, December 14, 2018 at 9:00am in the Hanna Cosman Meeting Room at the Municipal Center. The Brattleboro Representative Town Meeting Finance Committee will meet on Thursday, November 29, 2018, at 5:30pm at the Windham Regional Career Center (80 Atwood Street) in the Cusick Conference Room (2ndfloor). The Brattleboro Representative Town Meeting Human Services Review Committee will meet on Friday, November 30, 2018, at 1:00pm at Holton Hall (in the 2ndfloor conference room) on the Winston Prouty Campus (130 Austine Drive). I’ll be live-blogging the meeting again, so follow along and feel free to ask questions. They’ll be getting started soon, and I’ll be adding regular updates in the comments below. Parking rates are set to go up after the next regular meeting of the Brattleboro Selectboard. They’ll also be repealing the begging ordinance that caught the recent attention of the ACLU. 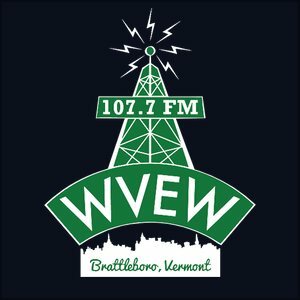 Brattleboro will buy sand and salt, get some bulletproof vest upgrades, and the board will review their goals as well as bulky item trash pickup. You can bring up other matters during public participation. 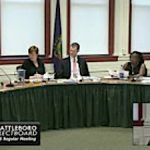 The biggest news of the Tuesday meeting of the Brattleboro Selectboard came not from the agenda but introductory remarks. The Town manager announced that Planning Services Director Rod Francis was leaving Brattleboro in the next couple of weeks. This was followed by an unscheduled but surprisingly active discussion of aggressive panhandling in the downtown area. Beyond those matters, the skatepark hired a design firm and got some extra cash, contracts and grants were approved, the utility budget passed, a long resolution was adopted, and more. The Brattleboro Citizen Police Communications Committee (CPCC) will meet on Monday, April 23, 2018 at 5:30pm in the Brooks Memorial Library Meeting Room. The Brattleboro Representative Town Meeting Finance Committee will meet on Thursday, April 26, 2018 at 5:30pm at the Brattleboro Tennis Club Meeting Room, located at 202 Cedar Street.